There's a lot of new stuff that has never been available before! In previous posts', I've also shown you how I make my quilt labels using my computer and framing them with fabric. This easy technique is quick, your label is sewn to your backing fabric before quilting, assuring that your labels can't be removed, and all your important information will be there forever! Would you like to know exactly how I do it? 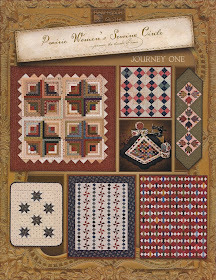 All of the How-To's about starching, and my labels are in my Heartspun Quilts Hints Book! This book has never been available thru my website before! 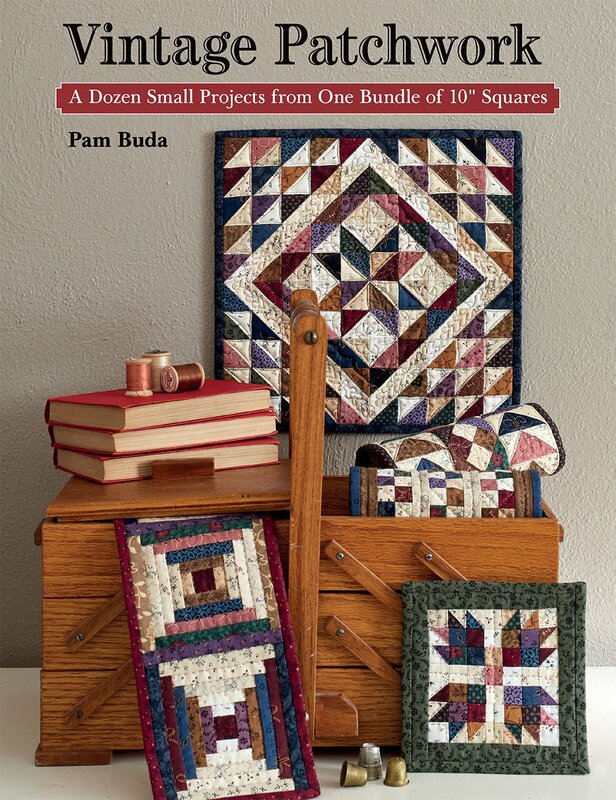 In addition to the chapters on starching fabrics and quilt labels, this 60+ page book is full of tips, secrets and hints on a wide variety of everyday quilting subjects! Read a full description of the book on the website. Check out my new lecture and workshop offerings! In addition to my most popular workshops, I've added a new "Make-Do" workshop to accompany the Making-Do lecture. workshops on a variety of techniques! Presently, I'm booking dates in 2012 and 2013. 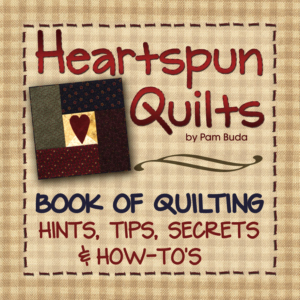 And....yes.....even the Heartspun Quilts Hints Book is on sale!! Click here to browse my website and place your order. After a very busy year my husband, son and I escaped to sunny and very hot Scottsdale, AZ for a week of vacation beside the pool. (Our daughter, Nicki, had stayed home to finish school and take care of our dog, Bella.) The pool was the only place you could tolerate the 100+ temperatures! We love it in Scottsdale and it was the perfect place to relax. We ate the most delicious food and enjoyed tropical drinks by the pool. I listened to two audio books and stitched a few basket blocks and loads of hexigons. We're back home now and trying to get back into the groove of normal work and home life. It was much easier to get into relaxing by the pool!! Ahh......lovely memories. Check back here for a big announcement that has been months in the making! I'm so excited!! Enjoy your day and thanks for stopping by to visit! 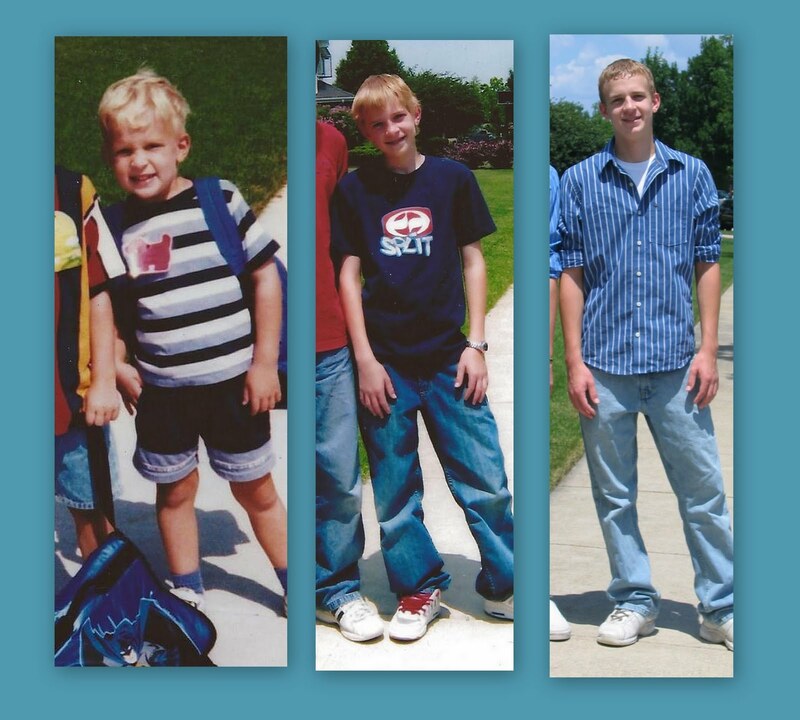 Left to Right - Ryan's 1st day of Kindergarden, 1st day of 8th grade, High School Graduation day. Yesterday, our son, Ryan, graduated the Fire Academy. From an early age, he knew this is what he wanted to be. He joined the Fire Cadets at the age of 15, and his sister, dad and I have lived and breathed the fire department along with him every day since then. All I can say is that we're very proud of him....and where does the time go?? He'll be starting Paramedic school soon. Be safe, Ryan. Love, Mom. 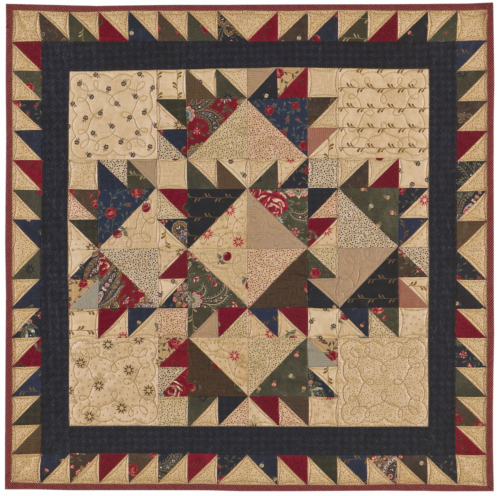 As promised, I wanted to talk about making scrap quilts. For those of us loving and obsessed with fabric, there's nothing better than making a scrap quilt, or two, or three...... 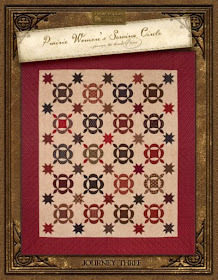 While I love scrap quilts for the variety of fabric, what I don't always like is how labor intensive they can be. Multi-tasking helps a whole lot! If I buy new fabric, before I store it, I take a piece from it to cut into small scraps for the five projects I'm working on. Subsequently, if I'm pulling fabrics for a new scrap project, I'm always thinking about whether those fabrics will work in the five other ongoing scrappy projects, and if yes, then I'm setting aside a piece to cut for them as well. 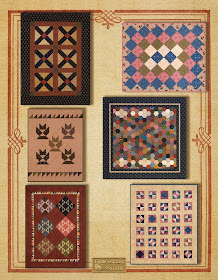 I'm working on the basket quilt from Blackbird Designs' When the Cold Winds Blow book. This is my very first attempt (emphasis on attempt!) 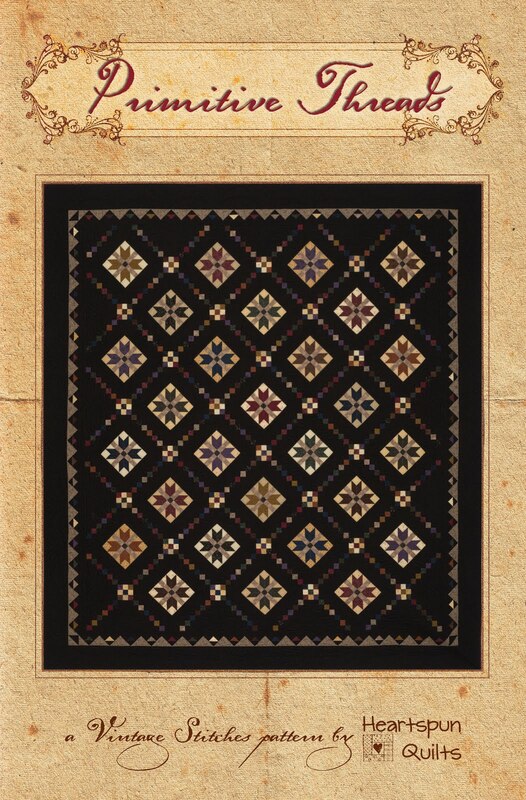 at needle-turn applique. Hopefully, by the time I make all 297 basket blocks (I've made 76 to date), I'll know what I'm doing. This is definitely a long-term project. I have no idea when I will complete it, but I do work on it a little each month and am thoroughly enjoying the journey! 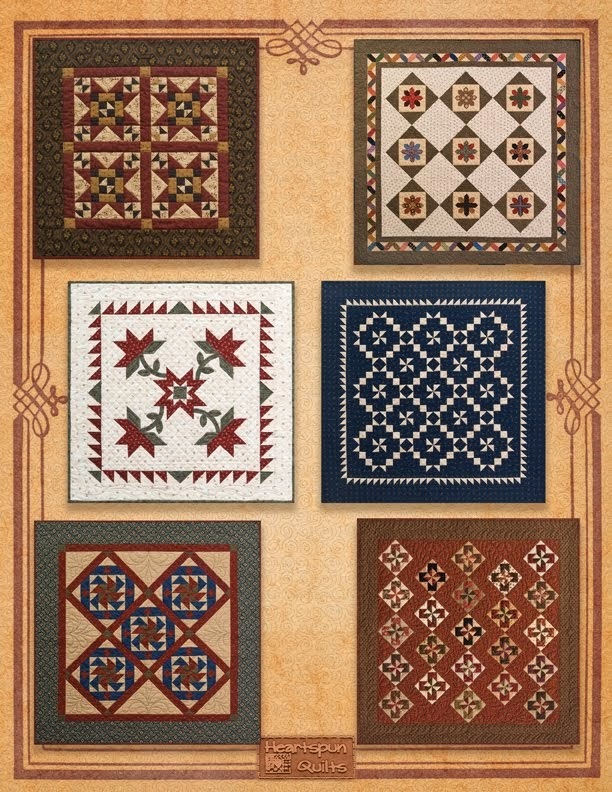 Oh how I love little blocks, and I've always loved the Thimble quilt. 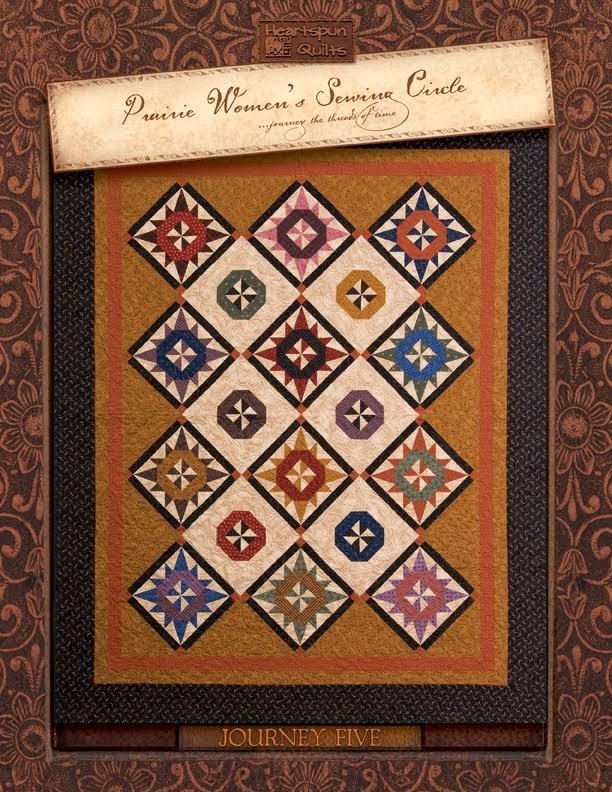 When my friend, Tara Lynn Darr's (Sew Unique Creations) new book came out, Simply Charming, I knew I had to make her little Thimble quilt. I've been cutting thimbles for awhile now. I haven't progressed any further sewing them together, but I do have a very healthy stack of them ready to go when I have time to sew. I've been making Yo-yos for awhile now and can't seem to stop. I've used my stash of Yo-yos in several Prairie Women's Sewing Circle projects and have worked to re-build my supply....never tiring of them. They're easy, mindless sewing that are fun to take-along. I also love how different the fabric can look once they're made into cute little Yo-yos. Another long term project is paper piecing 4 inch Courthouse Steps blocks. I have 2 major projects that will use these blocks and they require tons of assorted 1 1/4 inch strips. Cleaning and organizing the 'ol scrap bins gave a huge boost to my tiny strip needs. 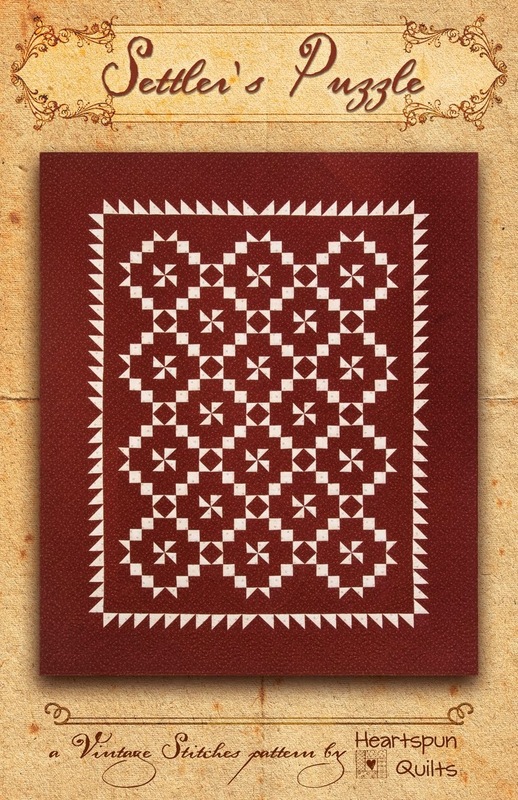 Lastly, my newest obsession is English Paper Piecing hexagons. This is my short-term project. Once I've made all of the Hex's I need for my project, I have a feeling that, like the Yo-yos, I'll probably never stop making them. 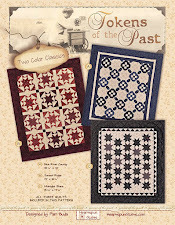 They are quite addicting and English Paper Piecing is enjoying a huge surge is popularity of late. Although all of these projects are -works in progress- there are already countless hours of work in these scraps. They are just too cute to hide in a bin, so I display and enjoy them while I keep working. I think the hexagons and the Yo-yos look great in bowls. Great eye-candy! I have a second small design wall behind the door of my sewing room. There, along the edge from the top to the floor, I have pinned all of my basket blocks according to color. Everyday I can enjoy them. 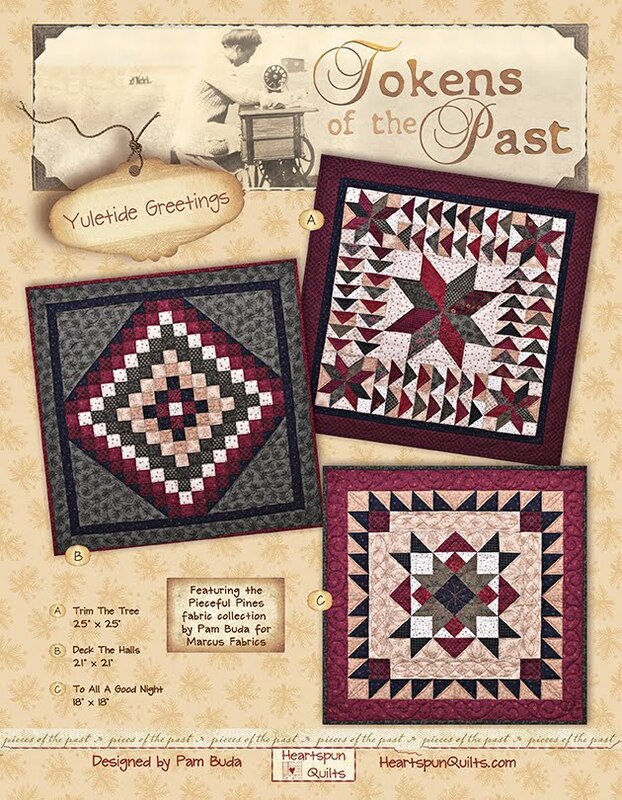 I don't have to wait to enjoy them until the quilt is finished...whatever year that may be! To answer my own question.....what is the smallest size scrap worth saving? Normally, I save anything 2 inches and larger, but because of the Courthouse Steps blocks, I'm now saving smaller pieces. 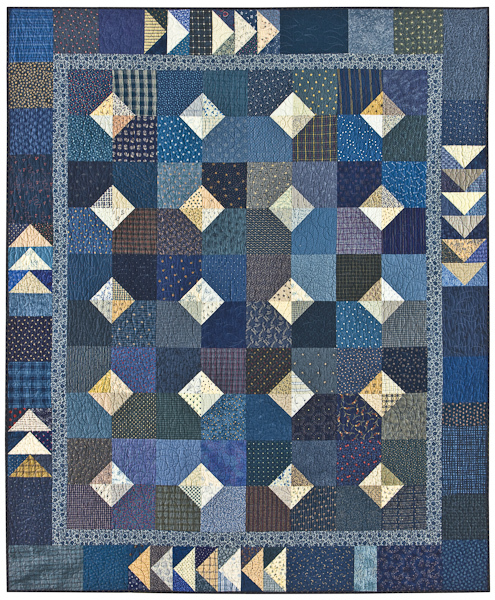 I'd love for you to comment and share your tips about organizing your scraps and how you prepare to make those lovely, labor intensive scrap quilts! Thanks for visiting with me today! 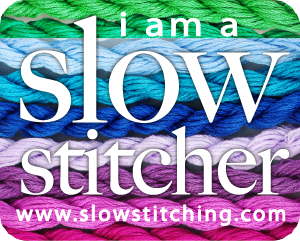 Feed your soul with the stitches you sew! Scraps, Scraps & More Scraps!!! Having all of these scraps isn't necessarily a bad thing. 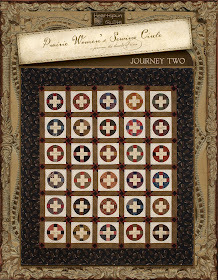 I adore scrap quilts and have made more scrap quilts than select fabric quilts (for lack of a better term). What became unbearable about this method of storage was when I needed to dive in and look for something, usually in a hurry, I made a big mess throwing the fabrics on the floor, and had to search for what I was looking for, which took more time that I wanted it to. When we began the renovations to the house, moving and shifting things around in a big way, I decided it was time to do something about my scraps problem. Naturally, there are oodles of ways to sort and store your scraps. 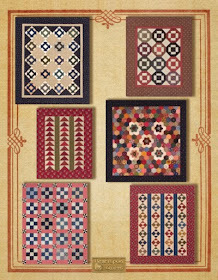 Some quilters cut them into multiple sized strips and squares making them ready for projects calling for those sizes, but I don't do that because I feel I'm spending time on a possible project that may never happen. I look for scraps according to color, so my solution was to organize by color. These stackable drawers provided the perfect solution for the space I had to work with. They were inexpensive and roomy enough. Over many months, I sorted though every scrap. They came out of the rumpled storage tubs and were pressed to save room in the drawers and would be ready to use when I needed them. So far, it's working well! As I create new scraps, I only have to open the color drawer and file them away for future use. It has taken a lot of time to go through all of those bins, but I feel a great sense of accomplishment having purged and organized. Organization usually does that for me! I'm weird, I know! Oh, but I'm not alone! Check out this post from StashManicure.Blogspot.com. In my next post, I'll talk about my love for scrap quilts and how I tackle making them. I'd love to know how you handle your scraps? What size scrap is too small to save? Hope you can make time to sew today! Me too! First things first.....we have a winner! The Random Number Generator chose number 10....so congratulations go to Jill! 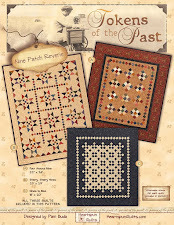 Please email me with your address, Jill, and I will get your fat quarter bundle off to you so you can start stitchin'!! My thanks to eveyone who took the time to comment about their busy and not-so-busy lives. I sure was comforted to read that I'm certainly not alone living a busy life. I'd like to clarify what "busy" means to me. If I had to choose between being bored or busy, I'd choose busy every time. I definitely choose to lead a busy (lets call it 'full') life and while I certainly have things to do that feel every bit the chore they are, I am fortunate that I have fun and adventuresome things keeping me busy as well. When "busy" becomes a lifestyle like ~ I'm running to catch a train ~ all of the time....then that's way too busy! From your comments, some of you have trains to catch yourselves. I seem to be in that mode for a bit longer than I'd like. I need the train to pull into the station, perhaps go in for repairs for awhile before I get back on!! I did take some time to arrange a few of my favorite things in the house ~ Strawberries! If you're a regular reader of this blog, you'll remember awhile ago I talked about decorating the house for holidays, etc, and how I've scaled way back over the years, and have gone to arranging a few vignettes from time to time. Well, June is strawberry month here. The treenware on the kitchen island holds several large wool strawberries hiding in the back, a wool pillow and framed cross stitch. Among my favorite strawberries are the 3 at the bottom right corner of the photo, which are ordinary rocks that a talented tole painter transformed into strawberries! This strawberry display is in our family room. 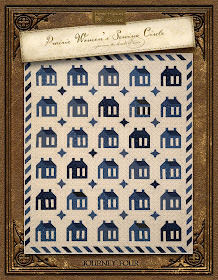 The framed wool applique is a design by the Need'l Love company from their Strawberry Threads book. 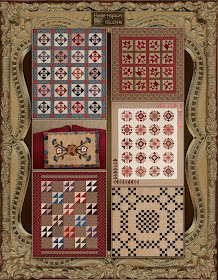 A strawberry sampler, antique plate and a bunch of little wool strawberries round out the vignette. It really doesn't take much to make a cute display and I love changing things up. Now this is the kind of decorating I can find time for! Just what have I been up to? Well....orders are coming in after market, which is a good thing, and I had out-of-town company over Memorial Day....also a good thing! 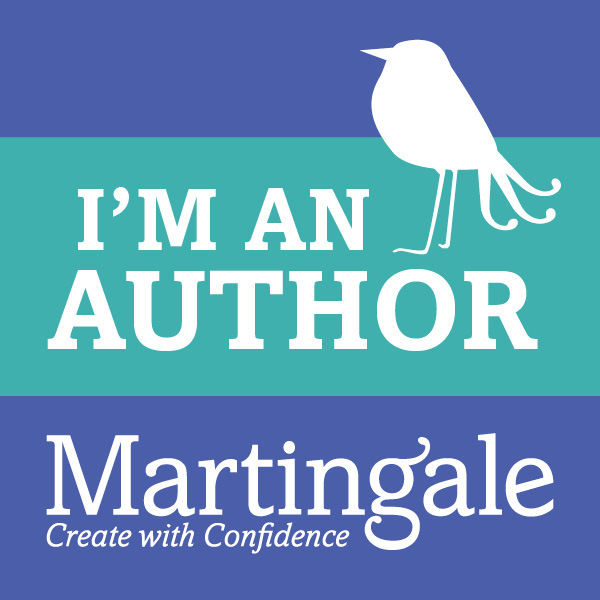 There's the usual laundry, cooking, gardening, etc, but what has been keeping me most occupied is working on my new website. I want it to be finished in the worst way....for many reasons. As with all new things, especially those in technology, there's the inevitable learning curve. I am figuring out how to manage the new website and more to the point, the folks who created it for me kinda made it dummy proof, but it still takes so much time learning new stuff!!!! I figure that while I'm concentrating and thinking so hard that I have to be warding off Altzheimers for sure! I'm hoping that it will be finished within the next week. I can't wait to show it to you! In the meantime....I want to do something I haven't done in awhile and that is to give some fabric away! An extra fat quarter pack of Jo Morton's Toasty fabric came home with me at quilt market! Would you like it? To enter the give-away, leave a comment about your busy life (or relaxed one) before midnight on Sunday, June 5th. Hopefully...by then...my new website will be up and running. Cross your fingers!